Here is our complete list of universal dust boots. What do I replace my rubber Ball Joint or Tie Rod End dust boots with? Many of you are discovering that your tie rod dust boot or ball joint dust boot has rotted away or even split. 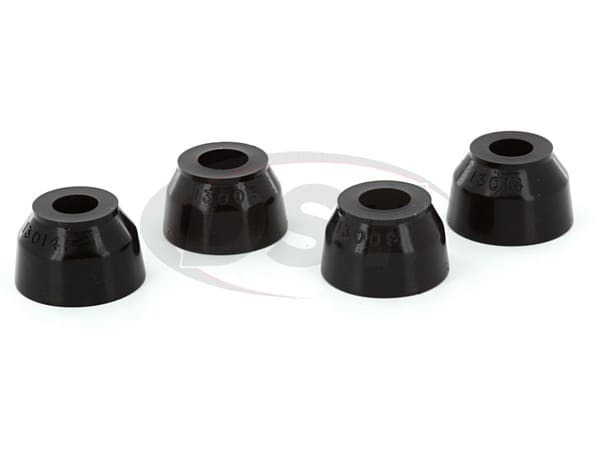 As a solution, Energy Suspension offers several universal polyurethane dust boots to replace these on your vehicle. You will need to measure three points on your existing joint in order to choose the right boot. Measure the diameter of the base, the diameter of the Pin or Stud, and the height of the boot. With this information you can visit our Universal Dust Boot page to find a part number that you can use to replace your OE boots. Great boot kit for my 61 Electra front ball joints, top and bottom, perfect fit and quality. Ball joint dust boots good product keeps grease in. Fast shipping, and good quality. Still need some modification to fit on my G35. But that's ok because its a universal dust boot. High quality materials and fit my application as described, I highly recommend this product.